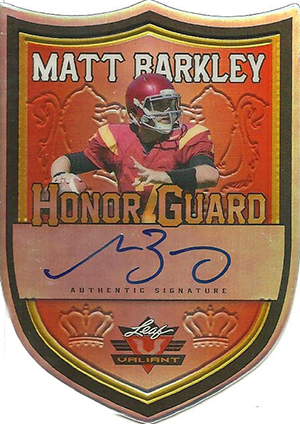 2013 Leaf Valiant Football gives collectors some of the first autographs of the year's rookie crop. 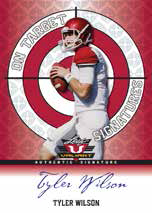 Featuring its trademark regal look, every card in the release has a signature. Better still, all autographs are on-card. 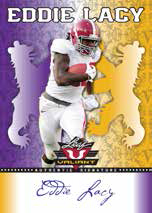 The design for 2013 Leaf Valiant Football has been tweaked but the overall look is unmistakable. Printed on chromium-style card stock, backgrounds are intricate. They are also cast against a regal backdrop. Base autographs come with a variety of colored parallels, much like the Donruss Crusades inserts from the 1990s that inspired the line. Parallels come in varying rarities. 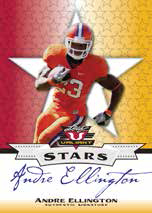 2013 Leaf Valiant Football also has a trio of inserts. Stars highlights top players. 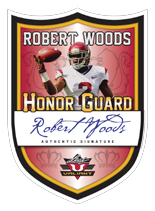 On Target Signatures has a more wild design, putting a bright target in the background.Honor Guard features a die-cut design resembling a shield. 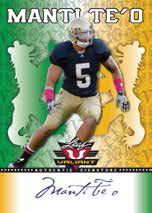 Signers for the set include Manti Te'o, Mike Glennon, Eddie Lacy and Matt Barkley. Leaf has pledged to focus on key offensive players more coveted by collectors. 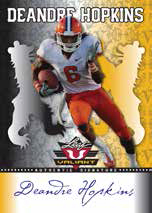 They have also said that 2013 Leaf Valiant Football has a smaller print run than the previous year's set. 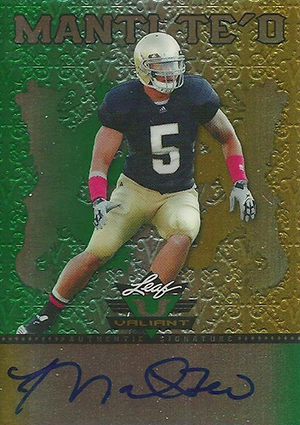 Leaf is also promising a big surprise for both this set and 2013 Leaf Metal Draft Football. 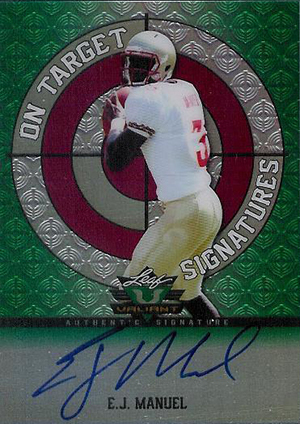 Inserted as a redemption, the card won't be revealed until the set is live. According to the card maker, it's also more plentiful in Valiant than it is in Metal. 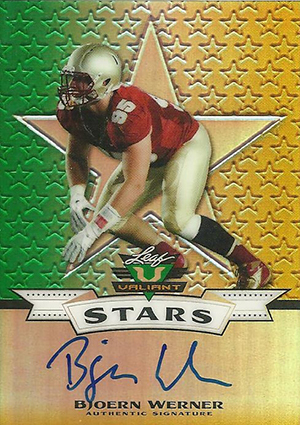 2013 Leaf Valiant Football Box - 5 Autos!! !